WASHINGTON - A prominent physicist and skeptic of global warming spent two years trying to find out if mainstream climate scientists were wrong. In the end, he determined they were right: Temperatures really are rising rapidly. Yet he found that the land is 1.6 degrees Fahrenheit warmer than in the 1950s. Those numbers from Muller, who works at the University of California, Berkeley, and Lawrence Berkeley National Lab, match those by the National Oceanic and Atmospheric Administration and NASA. What's different, and why everyone from opinion columnists to cable TV's satirical "The Daily Show" is paying attention, is who is behind the study. One-quarter of the $600,000 to do the research came from the Charles Koch Foundation, whose founder is a major funder of skeptic groups and the conservative Tea Party movement. The Koch brothers, Charles and David, run a large privately held company involved in oil and other industries, producing sizable greenhouse gas emissions. Muller's research team carefully examined two chief criticisms by skeptics. One is that weather stations are unreliable; the other is that cities, which create heat islands, were skewing the temperature analysis. "The skeptics raised valid points and everybody should have been a skeptic two years ago," Muller said in a telephone interview. "And now we have confidence that the temperature rise that had previously been reported had been done without bias." Muller said that he came into the study "with a proper skepticism," something scientists "should always have. I was somewhat bothered by the fact that there was not enough skepticism" before. There is no reason now to be a skeptic about steadily increasing temperatures, Muller wrote recently in The Wall Street Journal's editorial pages, a place friendly to climate change skeptics. Muller did not address in his research the cause of global warming. The overwhelming majority of climate scientists say it's man-made from the burning of fossil fuels such as coal and oil. Nor did his study look at ocean warming, future warming and how much of a threat to mankind climate change might be. "Greenhouse gases could have a disastrous impact on the world," he said. Still, he contends that threat is not as proven as the Nobel Prize-winning Intergovernmental Panel on Climate Change says it is. On Monday, Muller was taking his results  four separate papers that are not yet published or peer-reviewed, but will be, he says  to a conference in Santa Fe, New Mexico, expected to include many prominent skeptics as well as mainstream scientists. "Of course he'll be welcome," said Petr Chylek of Los Alamos National Lab, a noted skeptic and the conference organizer. "The purpose of our conference is to bring people with different views on climate together, so they can talk and clarify things." Shawn Lawrence Otto, author of the book "Fool Me Twice" that criticizes science skeptics, said Muller should expect to be harshly treated by global warming deniers. "Now he's considered a traitor. For the skeptic community, this isn't about data or fact. It's about team sports. He's been traded to the Indians. He's playing for the wrong team now." Muller's study found that skeptics' concerns about poor weather station quality didn't skew the results of his analysis because temperature increases rose similarly in reliable and unreliable weather stations. He also found that while there is an urban heat island effect making cities warmer, rural areas, which are more abundant, are warming, too. 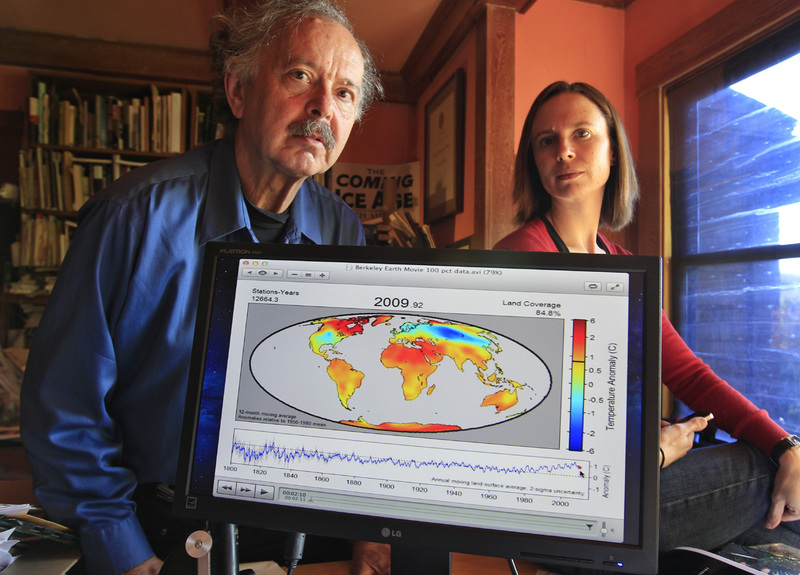 "After lots of work he found exactly what was already known and accepted in the climate community," said Jerry North, a Texas A&M University atmospheric sciences professor who headed a National Academy of Sciences climate science review in 2006. "I am hoping their study will have a positive impact. But some folks will never change." Chris Field, a Carnegie Institution scientist who is chief author of an upcoming intergovernmental climate change report, said Muller's study "may help the world's citizens focus less on whether climate change is real and more on smart options for addressing it." Some of the most noted scientific skeptics are no longer saying the world isn't warming. Instead, they question how much of it is man-made, view it as less a threat and argue it's too expensive to do something about, Otto said. Skeptical MIT scientist Richard Lindzen said it is a fact and nothing new that global average temperatures have been rising since 1950, as Muller shows. "It's hard to see how any serious scientist (skeptical, denier or believer  frequently depending on the exact question) will view it otherwise," he wrote in an email. In a brief email statement, the Koch Foundation noted that Muller's team didn't examine ocean temperature or the cause of warming and said it will continue to fund such research. "The project is ongoing and entering peer review, and we're proud to support this strong, transparent research," said foundation spokeswoman Tonya Mullins.